Panel 4 is the most fantastic bird. In fact I think I’m on my way to liking seagulls a little more again. … do you mind if i ask you what happened with the color trouble? Oh, we suddenly had a bunch of time get consumed by other stuff, so our schedules didn’t overlap really well. We’re not fully matched up, yet, but it’s much better! Renee’s still in it. Gosh, that must be the most beautiful seagull I’ve ever seen. Indont know about you but I get a lot of “Mine. Mine. Mine. Mine.” from this page. That bird is really pissed off about something. So, that sky there… Is it overcast, or is it clear behind those clouds and just desaturated like the rest of Diver’s world? So predatory! I really like the personality of the terror gull. 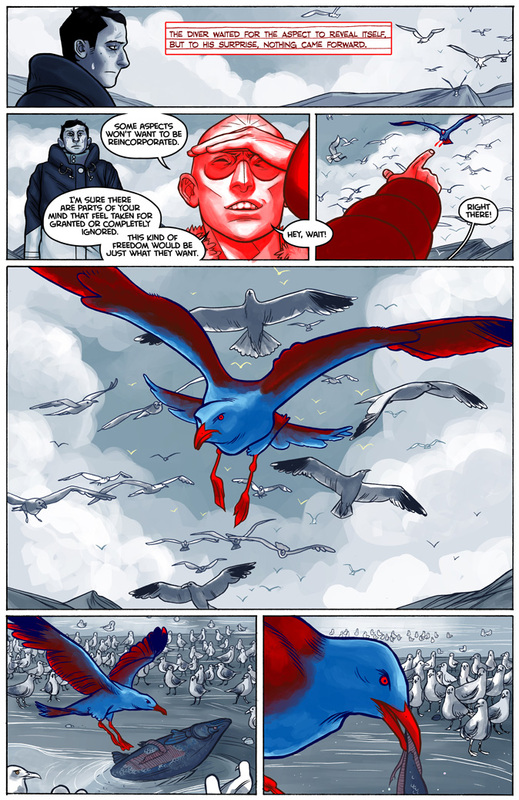 Also, I giggled at the gull in the bottom left. Haha, now that you mentioned it, that seagull’s expression is so much more hilarious.